If you’re new to the industry, the language used can appear quite daunting at first. This guide looks at some key terms and phrases that you’ll be learning about and using during your electrical training with us. Twin and Earth (1) – This is the most common cable used in domestic electrical installations, it is a flat grey thermo-plastic sheathed cable. Inside, it has two single conductors of the same size that are both separately insulated, one is brown in colour denoting its intended use as the line conductor, and the other is blue, denoting its intended use as the neutral conductor. A third un-insulated conductor sits between the two and this is used as the Circuit Protective Conductor or ‘earth’ as it is commonly known. Flex (2) – A flexible cable that has a soft rubber or thermoplastic outer sheath and individually insulated conductors inside it. Each individual conductor is made up of very fine strands of copper to allow the cable to repeatedly flex. SWA (3) – Steel Wire Armour, this is a cable that is surrounded by a layer of armour made up of steel wire, it is generally used where the cable requires a high degree of protection. LSHF (4) – Low Smoke Halogen Free cable is a cable with a particular type of insulation that is designed so that it emits a small amount of smoke and zero halogen when exposed to fire or heat. ‘Singles’ (5) – A colloquial term used for when a cable is a self contained single conductor, can refer to any cable that is singular, however in a domestic setting PVC insulated singles are often what is mean by the use of the term. Ohms – An Ohm is the electrical unit used for measuring resistance, its symbol is Ω.
Watt – This is a unit of power and is denoted by use of the letter W.
Voltage – Voltage is the difference in electrical potential between two different points, it can be thought of as electrical pressure, and it is denoted by the letter V or U.
Amperes – This is the term used to describe the flow of electrical current, it is denoted by the letter A.
AC- Alternating Current is an electric current which reverses direction periodically. AC current is the way that electricity is distributed through the power network in the UK. DC – Direct Current is an electric current that travels in only one direction, this is the type of current that a battery produces. Circuit breaker (1) – A type of protective device for circuits, it will protect a circuit from overload and fault currents. Fuse (2) – A fuse is a protective device. They are designed so that when more current is drawn through them than they are designed to take, a part of it melts, causing the circuit to become open and the electricity supply to become disconnected. RCCB (3) – Residual Current Circuit Breaker, what most people commonly refer to as an ‘RCD’, will often be found in a consumer unit protecting a bank of circuits. RCBO (4) – Residual Current Circuit Breaker with Overload protection, this combines the function of an RCD and a circuit breaker in one device and can be found protecting one circuit. SRCD – Socket Residual Current Device, as the name suggests this type of RCD is integral to a socket outlet. SPD – Surge Protection Device, these are devices designed to limit a sudden surge of electrical energy known as a transient over-voltage. Main switch (5) – Although not a protective device, in a typical household, the mains switch is located in the consumer unit. Its purpose is to disconnect the supply of electricity to the installation. Earth – In this context when we use the word ‘Earth’ we mean the general mass of the earth, which we treat as having an electrical potential of zero. Earth Electrode – Usually a solid copper rod that is driven into the ground to provide a means of earthing in TT earthing systems. Bonding Conductor – A conductor that provides protective equipotential bonding. 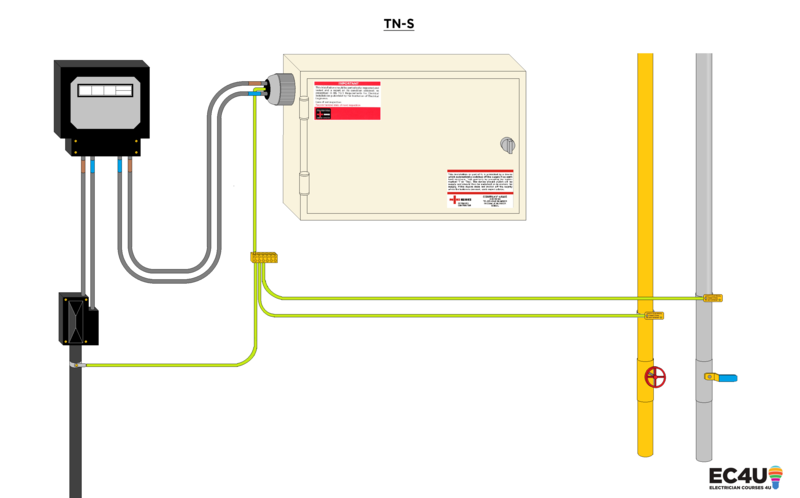 TN-S – A means of earthing commonly utilised in the U.K., the line, neutral and earth conductors enter the building as one cable, the line and the neutral conductors are in the centre of the cable and the lead sheath on the outside of the cable acts as the earth conductor. TN-C-S – A means of earthing commonly used in the U.K., in this cable the neutral conductor is also the earth conductor, this is known as a PEN (Protective Earth and Neutral) conductor. 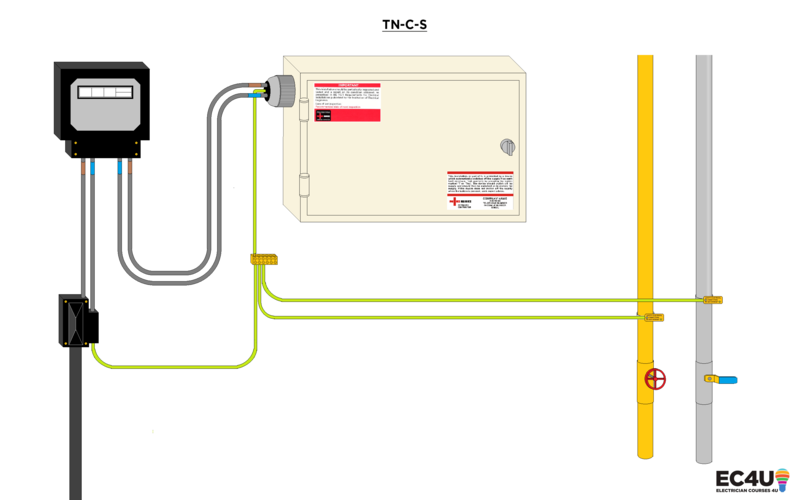 TT – A means of earthing commonly used in the U.K., in this installation there is no earth cable supplied by the distributor, instead use is made of a locally fitted earth electrode. 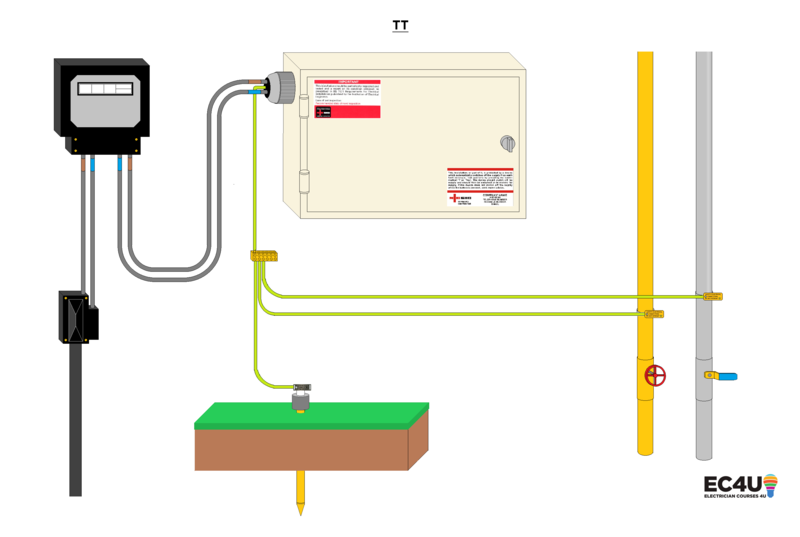 Earthing – This involves connecting the exposed conductive parts of an installation (such as gas and water pipes) to the main earthing terminal of the installation. MET – Main Earth Terminal, this is where all the earthing conductors are connected, from here they are connected back to the installations means of earthing. Earthing conductor – This is the conductor that connects the main earthing terminal to the means of earthing for the installation. Equipotential bonding – this is where extraneous-conductive-parts are connected together to keep them at the same potential and reduce the risk of electric shock. PEN conductor – Protective Earth and Neutral, this is one conductor that combines the functions of a neutral conductor and a protective conductor, the most commonly found example is in a TN-C-S earthing system. Protective equipotential bonding – Equipotential bonding that has been installed to provide safety. PME – Protective Multiple Earthing, this is the practice of connecting the PEN conductor of a TN-C-S arrangement to earth periodically along its length. Approved Voltage Indicator – A voltage detector that meets the relevant British Standard. Using one is essential to proving an installation/piece of equipment/circuit etc is safe to work on. Inspection – The act of examining the electrical installation. Safe Isolation – Safe isolation is checking to ensure that no electricity is present in the circuit about to be worked on and that the circuit cannot be re-energised by anyone other than the person working on it. Multi-function tester- A piece of test equipment that combines multiple testing facilities in one unit, an example would be the KEWTECH KT64. Proving Unit – A device which provides a known source of voltage on which an approved Voltage Detector is tested. Departure – A piece of work or equipment that deliberately does not follow the wiring regulations, the person responsible for the design must declare it, and that it is at least as safe as following the wiring regulations would have been. 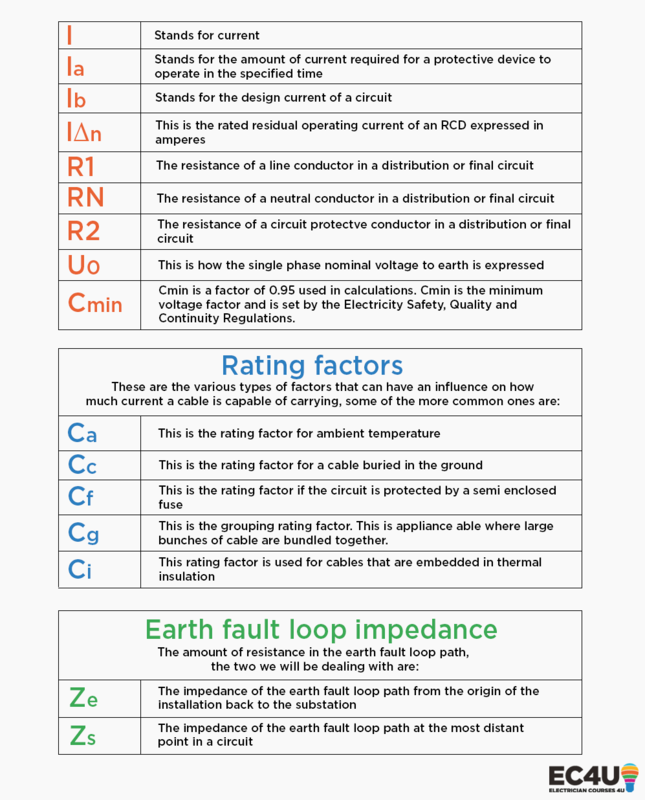 Design current – The amount of current that the circuit is intended to use in normal use. Consumer Unit (1) – Also commonly known as fuse board/box, this is where the circuits in an installation originate from and where your’ protective devices will be located. Fixed Current using equipment – A piece of equipment that is a permanent part of an electrical installation, an example would be a cooker that has been hardwired directly. Fused connection unit (2) – A fused connection unit is a type of accessory which protects a piece of fixed current using equipment. Accessory – This is something that makes up part of a circuit, but isn’t a fixed current using piece of equipment, an example is a socket. Appliance – This is any item of equipment that uses electrical current, the exceptions to this are standalone electrical motors i.e. those that aren’t part of a piece of equipment such as the motor in an extractor fan, and luminaires. Barrier (3) – Something to prevent contact with a live electrical part, for example a busbar cover within a Consumer unit. Basic protection – This protects you from electric shock under fault free conditions i.e. in normal use. Busbar – A solid strip of conducting material, usually copper, to which electrical equipment can be attached and powered. In a domestic setting these can be found inside the consumer unit, normally covered by a busbar cover to prevent someone coming into contact with it while energised. Cut-out – this is the colloquial name for the Supply Protective Device. The Supply Protective Device is a large fuse based at the origin of your installation, generally in a domestic property they are rated at 60A, 80A or 100A. They are the property of the DNO (Distribution Network Operator) and not to be touched by anyone other than them, unless they have given their express permission. Circuit – A circuit is an assembly of electrical equipment that originates at the same point and is protected by the same device. 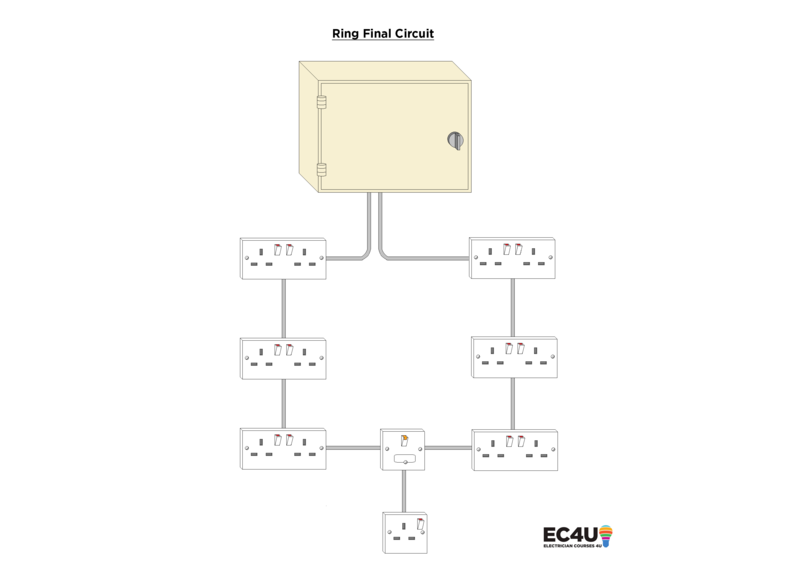 Final Circuit – The circuit that is supplying power to appliances via a socket, power to a fixed piece of current using equipment such as a cooker, or power to a lighting circuit. This is called a final circuit because it is the final part of the system. Distribution Circuit – A circuit that provides power to a distribution board. Radial Circuit – A circuit that has one set of conductors leaving a distribution board and terminating at the furthest point, an example would be a dedicated circuit supplying power to a cooker. Ring Circuit– A circuit that has two sets of conductors leaving a distribution board from the same point essentially forming a ring, generally only used for socket circuits. Double insulation – As well as providing basic insulation, double insulation provides an extra layer of insulation. Electrical equipment – When using the phrase ‘electrical equipment’ this can refer to any item that is part of the electrical system, such as fuses, generators, transformers etc. Electrical installation – An electrical installation is an installation made up of electrical equipment having a specific purpose. Enclosure – This is what surrounds a piece of equipment to provide protection from different types of external influences. Exposed conductive part – Part of a piece of equipment that can be touched. During normal service this piece of equipment should be safe to touch but it has the potential to become live under fault. Extraneous conductive part – A part that is not part of the electrical installation and that could introduce a path to earth for the electricity to flow in the event of a fault. Ferrule – Also known as an electrical crimp, this is a small metal tube that is placed over the stripped end of a multi strand wire and then crushed using a crimping tool to protect the end of the cable. They come in a variety of different types suitable for use in different applications. Functional switching – The action of operating a device to either vary, or switch on and off the electricity supply to a device. Insulation – Insulation is the material surrounding a conductor. Isolator – This is a device that is mechanically operated and is capable of isolating a particular circuit/piece of equipment as required. Line conductor – What a lot of people mistakenly refer to as the ‘live’ conductor. In a new installation this will be brown in colour and in older installations it will be red. Luminaire – This is the term for a light fixture. Lamp – What is often referred to as a ‘bulb’ a lamp is the part of a light fitting which emits the light. Main switch – This will be at the origin of the installation generally inside the consumer unit. When it is switched ‘off’ the consumer unit and all associated circuits will be de-energised. Meter tails – These are split into two parts, the meter tails from the service head to the electricity meter, and the meter tails from the meter to the consumer unit. Neutral conductor – The other ‘live’ conductor in a circuit. In older installations this will be black and in newer installations this will be blue. Origin of an installation – This is where the electricity is distributed to an electrical installation, in a house this would be the primary consumer unit. Plug – A piece of equipment designed to fit inside a socket as means of connecting an appliance or piece of equipment. Point – This is the part of a circuit that is intended to have current using equipment attached. Protective conductor (cpc) – A conductor used to provide protection against electric shock, often referred to as the ‘earth’ conductor. In a circuit, it is known as the CPC. CPC stands for Circuit Protective Conductor. Service cable – This is the cable that supplies electricity into a property, it is terminated in the service head. Spur – A spur is a branch off of a ring or a radial circuit. Socket outlet – Designed to work with a plug to allow the connection of electrical appliances. Tinned– This refers to the practice of soldering the end of a multi strand cable. This is the method that was used prior to the use of the ferrules for the same purpose. It is no longer allowed in new electrical installations but may still be encountered. Cable management system – A means of supporting and managing cables in an installation. Cable tray (1) – Long, formed sections of material usually metal and usually perforated to allow heat to escape, they are open and the cable sits on top of them. Cable conduit (2) – Generally round in section, essentially a length of tube, can come in a variety of materials and sizes, cables are drawn inside it. Cable trunking (3) – Usually rectangular in section with one side being entirely removable, can come in a variety of materials and sizes. ADS – Automatic Disconnection of Supply – This is what prevents a dangerous occurrence arising in case of a fault condition. It is made up of basic protection and fault protection. It refers to the fact that a combination of methods of protection will disconnect the supply of electricity if a fault occurs. Current carrying capacity – The amount of electrical current a cable or piece of equipment can handle safely. Electrical potential – This is the amount of work that is required for an electric charge to move from one point to another. Fault current – A current arising from a fault in an electrical installation. Over current – this is where the current exceeds the rated current of the electrical equipment; with over current the circuit is considered unhealthy. Overload current – Overload current is where more current is drawn through the circuit than it has been designed for, but the circuit is still considered healthy. Prospective fault current – The amount of current that could potentially flow between conductors in the event of a fault. Resistance – The amount of opposition to the flow of electricity through a conductor. Selectivity – This is the act of selecting your protective devices, so only the one you want operates when a fault is detected. Short circuit current – This is a fault current between two live conductors; Such as between line and neutral. In this instance the circuit is treated as unhealthy. Extra low voltage = 50V and below for AC systems. Low voltage = Greater than Extra low voltage, but doesn’t exceed 1000V AC between conductors or 600V AC between conductors and earth. High Voltage = Greater than low voltage. Distributor – The person (in this case person refers to a company) who is responsible for the distribution of electricity. DNO – Distribution Network Operator, these are the companies licensed to distribute electricity around the UK. ESQCR – The Electricity Safety and Continuity Regulations, these are the regulations that the Distribution Network Operator works too. Minor works – Electrical work that does not normally require notification to a building control body, examples include extending or altering an existing circuit that is not in a special location (such as a bathroom). Notifiable work – Electrical work that requires the relevant building control body to be notified, examples include installing a new circuit or replacing a consumer unit. Building Regulations – These are the regulations that should be complied with when building work is carried out. Wiring Regulations – Colloquial name for BS7671 Requirements for Electrical Installations. Part P – Part P of the Building Regulations details how to safely install an electrical system in a domestic property.